The Santa Clara County Section includes publications, articles and special resource links for SCC immigrants. All of these links and much more can also be found in the Resources Search page. Monthly newsletter from the Santa Clara County Office of Immigrant Relations with information on paid internship opportunities, 2019 Citizenship Day, and local news and events of interest to the SCC Immigrant community. Given the continuously changing nature of the immigration landscape in 2017, the SCC Toolkit for Schools Districts to Support Immigrant Students and their Families provides physical and human resources that will aid in the building of community capacity to support immigrant parent engagement in public schools. The toolkit aims to support schools by providing resources that will enable the schools to better meet the unique needs of immigrant students and their families. SCC Short Multi-language You-Tube, with welcoming messages. Featuring favorite moments from the Beacon of Light Awards with photos and a brief description of the Awardees and their accomplishments. The Asian Pacific Family Resource Center is one of the ethnically focused Family Resource Centers created by the Social Services Agency. This organization has an Asian focus, but is open to people of any ethnic background. Started in April 1995, The Asian Pacific Family Resource Center provides a variety of services in a number of Asian languages, including, Chinese, Vietnamese, Cambodian, Filipino, and Korean. The many services offered are geared to both youth and adults. These programs include: English as a second language classes, parent education classes, special needs, autism, family, parent support programs and tutoring, gambler's anonymous, individual counseling, youth leadership, and tutoring. 9/28/18 In his new book, "Dear America: Notes of an Undocumented Citizen," Jose Antonio Vargas recounts his own story of growing up in Mountain View and living for years with the fear of being outed as a non-citizen. He uses his biography to show a national paradox -- a country wedded to undocumented residents in spite of a national system that refuses to recognize them as anything other than illegal. 5/18 Santa Clara County Rapid Response Network (RRN) was one of the local collaborations recognized as 'change makers'. 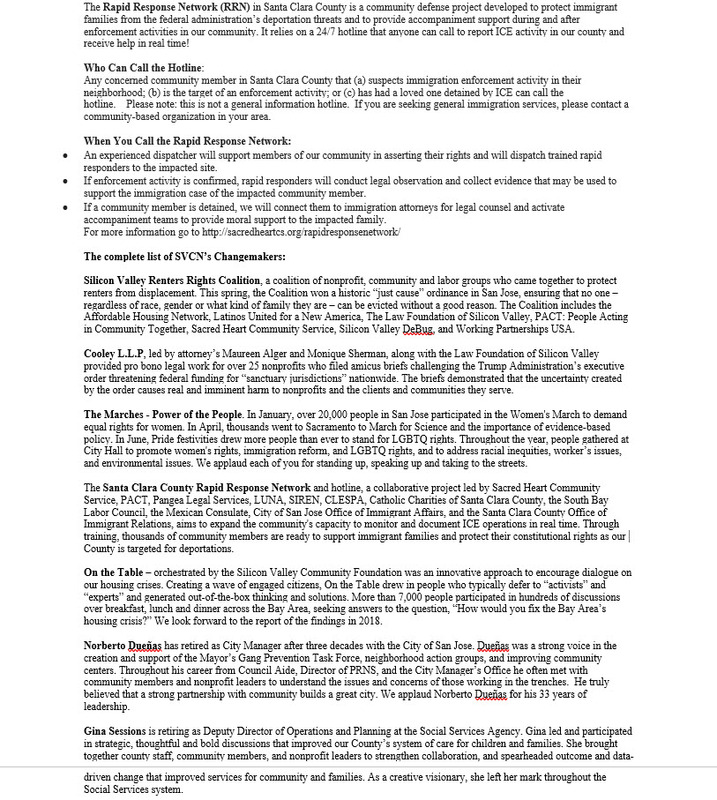 The SCC RRN and hotline, a collaborative project led by Sacred Heart Community Service, PACT, Pangea Legal Services, LUNA, SIREN, CLESPA, Catholic Charities of Santa Clara County, the South Bay Labor Council, the Mexican Consulate, City of San Jose Office of Immigrant Affairs, and the SCC Office of Immigrant Relations, aims to expand the community's capacity to monitor and document ICE operations in real time. Through training, thousands of community members are ready to support immigrant families and protect their constitutional rights as our County is targeted for deportations. Since 1998, the City has provided a unique service to meet the needs of our growing and diverse community: the Multilingual Community Outreach Program.This program, unique in the Bay Area, provides City and community information to residents in four languages - English, Spanish , Chinese , and Russian - regarding City programs and services. In an effort to reach residents, particularly individuals who might not have access to traditional communication methods, the City provides multiple services. Multilingual information is provided on City Services, Community Emergency Response Training (CERT) classes, City events, housing, as well as mediation services and other topics, both in person and by phone at (650) 903-6145. 6/30/18 Calling on President Donald Trump to reunite more than 2,000 immigrant children separated from their parents at the U.S.-Mexico border, Bay Area residents on Saturday joined hundreds of thousands of people across the nation to protest - some for the first time ever - a policy many say is a haunting reminder of America's darkest moments in history. Braving scorching heat, local protesters delivered a clear and loud message to the president: "families belong together." 3/30/19 Hundreds of people enjoyed a beautiful sunny day with music, dancing, cultural performances, games, colorful costumes and smiling faces. The SCC Office of Immigrant Relations, Registrar of Voters and local service providers offered information about local resources.. There were displays and performances from many of Mt. View's diverse residents, including Mexican, East Indian, Pakistani, Chinese, Vietnamese, Cambodian, Indonesian, and more. Thanks to the City of Mt. View for sponsoring this event where people from every ethnic and age group can appreciate each other and experience the joy of a diverse community.